Two industry stalwarts at a turning point -- which is succeeding in its turnaround efforts? One of the keys to survival in the business world is the ability to adapt, whether it's in response to changes in consumer behavior or the ever-evolving world of technology. This key differentiator can be found in any company that has stood the test of time. 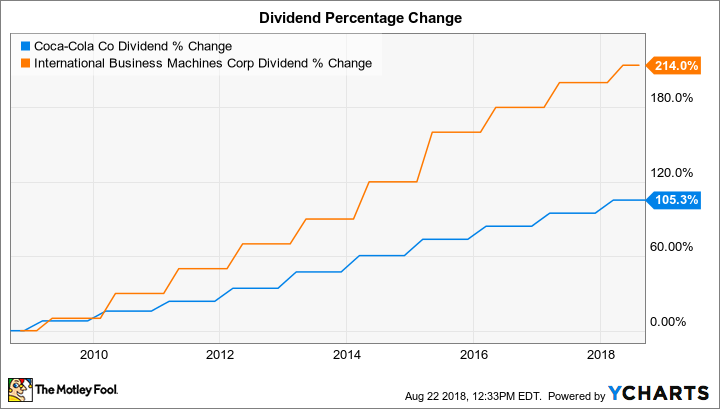 Both International Business Machines Corporation (NYSE:IBM) and The Coca-Cola Company (NYSE:KO) have undergone many successful transitions over the years. More than a century ago, IBM began as a company that developed time clocks, computing scales, and tabulating machines, while Coke started out as a nerve tonic. In the wake of declining revenue and profits, both companies have been engaged in a multiyear transformation. I first covered this matchup more than a year ago, so let's see how they're progressing and which is the better buy. Changing consumer behavior, led by healthier lifestyles and waning interest in soda, has forced Coca-Cola to up its game. The company has been working to reduce the amount of sugar in its flagship drinks, while adding a variety of low- and no-sugar alternatives, including soy-based beverages, teas, waters, and juices. IBM has faced its own challenges, forced to shed many of its legacy hardware and software businesses, while building out what it calls "strategic imperatives," which include analytics, cloud computing, artificial intelligence, security, and mobile. While both companies have struggled with declining revenue over the past five years, IBM's focus on its high-growth initiatives is beginning to pay off. The company has achieved revenue growth in each of the previous three quarters, after posting 22 consecutive quarters of year-over-year declines. While some of that growth was fueled by currency exchange rates and a mainframe refresh cycle, it's a vast improvement compared with more than five years of declines. At the same time, Coke's revenue has continued to fall, notching another 11% decline over the past year. Clearly, IBM's turnaround is taking hold more quickly than Coke's. The stock prices of both companies have been treading water over the preceding 12 months, though IBM has eked out a 3% gain compared with Coke's less-than-1% increase. While investors watch for the long-awaited business transformations, IBM and Coca-Cola have both continued their generous capital return policies. While each boasts a declining share count as the result of buybacks, Big Blue's repurchases have been more meaningful. Coke's share count has declined by 0.21% over the previous 12 months, while IBM has reduced its share count by 1.4%. Taking a longer view is even more telling, as IBM's total shares have fallen by 16% over the past five years, compared with Coke's decline of just 3.7%. Both companies also have a long dividend history. IBM has been making payments since 1913, and has raised its dividend for 23 consecutive years. Coca-Cola started sending checks in 1920 and has increased its payout in each of the past 55 years. While a long record of payouts is a great indicator, investors are also interested in what's been happening lately. While Coke sports an above-average yield of 3.35%, IBM's is markedly higher at 4.3%. While declining stock prices have played a part in these higher yields, a review of increases in recent years provides color. While Coca-Cola's payout is up 105% over the past decade, IBM's has increased by 214%. These numbers can't be viewed in a vacuum, and the potential for future increases must be considered. At first glance, neither looks particularly attractive, with Coke paying out 269% of its profits, while IBM is using 97%. Unfortunately, provisions related to last year's U.S. tax reform has skewed the results for both companies. The tech giant took a charge of $5.52 billion, while the soft drink provider set aside $3.61 billion. Adjusting for these one-time charges results in a payout ratio of 106% for Coca-Cola and 49% for IBM. When it comes to capital returns, Big Blue has the clear advantage. From a price-to-earnings perspective, IBM is the superior value at first glance, currently trading at 23 times trailing earnings, compared with Coke's valuation of 85. These numbers are again thrown off by the tax charges mentioned above. Adjusting for these one-time hits, Coke's PE falls to 33, while IBM's drops below 12, making it a significantly better value. All told, IBM offers investors a clearer opportunity. 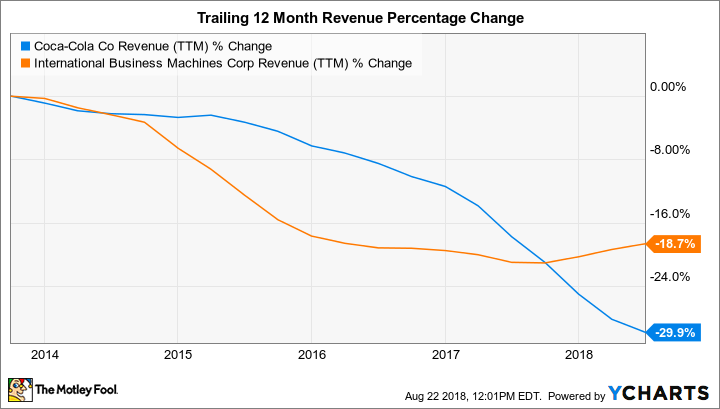 There's no doubt that challenges remain for both companies, but improving revenue, higher yield, and lower valuation are all solid indicators that IBM is a better buy.